Muriel Bolger offers her top 10 tips on tackling New York for a Christmas shopping spree. Yes – it’s that time when you discover your friends, your book club, your neighbours, your in-laws, and just about everyone you know, are ALL heading off to New York to shop for Christmas. If you’ve been promising yourself this indulgence every year but kept putting it off – then do it now – there’s never been a better time. 1. The dollar exchange is very favourable, and if it stays as it has for a few months, you can expect to shave around 30 per cent off purchases at current rates when compared with your euro. 2. For peace of mind, and to save hassle looking for exchange bureaux and banks with additional charges, Order your foreign exchange in advance on line with No.1 Currency Pre-Order Currency Facilitybased in Dublin, they offer a great service with the best possible rates. 3. Remember there is a purchase tax in New York and this varies in different places within New York state itself. Expect to add anything from 4% to 8.87% on your purchases at the till. Some stores like Macy’s and Bloomingdales offer a discount if you can prove you are a foreigner (passport). 4. The Americans love coupons and cut them out of papers and magazine for added discounts. You can make your dollars go further by checking out some of the bigger stores before you travel and printing out any promotional codes and offers you find there. 5. Tipping is an integral part of any service in the States and considered part of the providers’ income. To save yourself embarrassment, you need to arm yourself with lots of small denomination bills before travelling so that you can tip the porter, the taxi driver, the server in the coffee shop etc. As a rough guide tip $1–2 dollars to a doorman for hailing a cab. The same for drinks served at a bar. The housekeeper expects $2-5 per day, depending on service, and bathroom attendants $1. In restaurants and beauty parlours the wait staff usually get between 15-20% of the total bill and most prefer their tips in currency rather than adding it to a credit card transaction. 6. Post Thanksgiving Day many shops have sales before the final push for Christmas, but be prepared – shopping in New York is a wearisome, though thoroughly exciting adventure, so wear comfy footwear and easy to get in and out of clothing if you intend trying things on. 8. Woodbury Common Premium Outlets is a favourite destination with Irish shoppers for its discounted designer shops and labels. 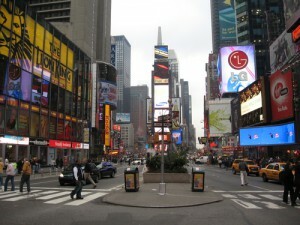 It’s serviced with shuttle buses from several pickup points in Manhattan for $35 return. Bring a large bag, preferably one on wheels and rent a locker for the day. Apart from getting very heavy parcels can get in the way too. 9. Take time out to enjoy the Big Apple in all its festive, glitzy glory. The window displays are magical and Lord and Taylor’s on Fifth Avenue are the best – always! This year their theme is Christmas in New York and each one depicts a vintage animated postcard vignette. 10. The Radio City Christmas Spectacular with the legendary Rockettes is an essential part of this city’s Christmas traditions. Don’t miss it. There are several matinees for the foot-weary to enjoy, but you need to book for them just as soon as you’ve ordered your dollars! Muriel Bolger is an author and award-winning travel writer.